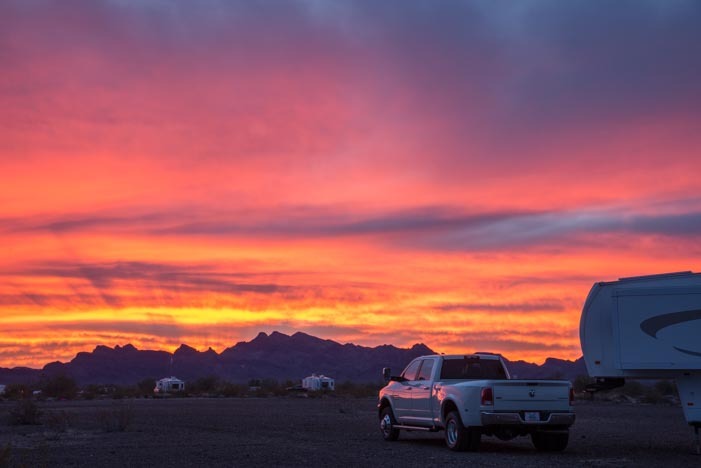 January 2016 – Before we went to Quartzsite this year, some soon-to-be full-time RVers asked us why it is that RV travelers go there. They were native Arizonans and they knew that Quartzsite is just a truck stop of a town on I-10 between Phoenix and LA. So why would such a dumpy little town swell from less than 4,000 people in July to something like a million people in January, almost all of them living in RVs? 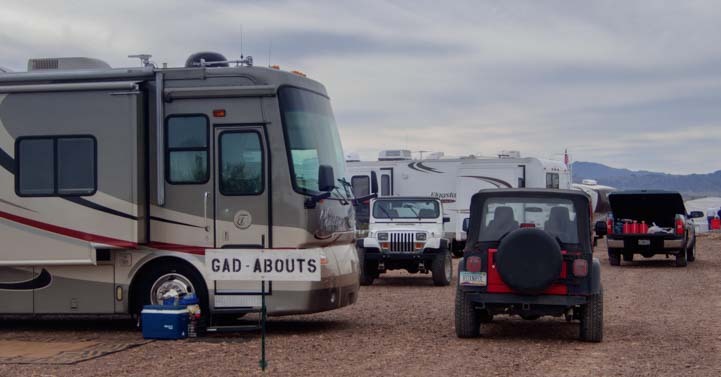 Quartzsite, Arizona, is a gathering place for RVers of all kinds each winter. We tried to explain about the January RV Show in town, and the 15 mile radius of retirees boondocking all around, and the huge rallies for owners of all kinds of RVs, from Montana fifth wheels to Alpine coaches and Safari motorhomes to dozens of other RV manufacturers. We talked about the moveable feast of pot-luck dinners, and the campfire cocktail circles at sundown, and the huge outdoor movie screens that folks set up, and the crazy flags flying from all the RV roofs, and the light shows people put on in the dark on their RVs. 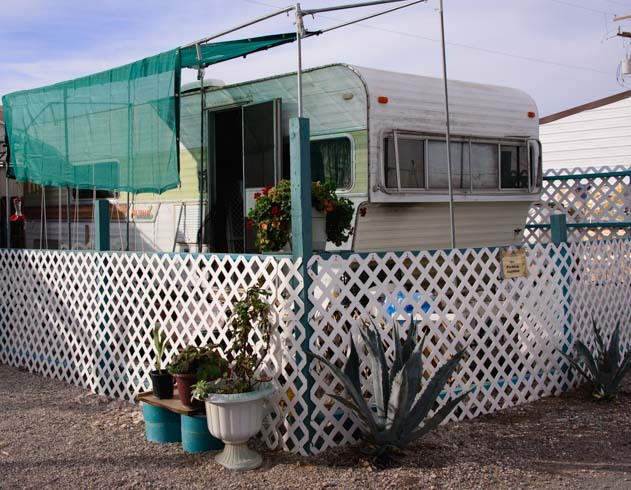 Quartzsite is best known for its wild RV boondocking scene in the desert. “So it’s a social thing?” They asked. Well, yes, we realized. In a nutshell that’s what it really is. 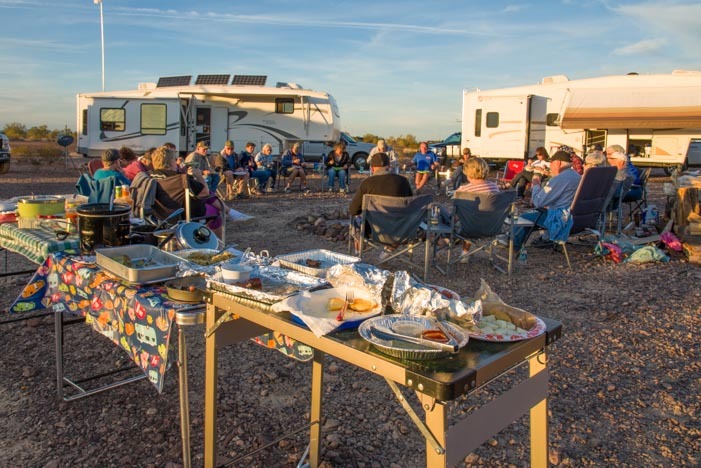 Quartzsite is “The Gathering Place,” and it seems that almost everyone who is living in the southwest in their RV in January swings by for a day or a week or a month. Some even spend the whole season here. There are RV parks in town with full hookups, and some folks stay all winter — or even all year! There are all kinds of places to park an RV and to get together with friends. 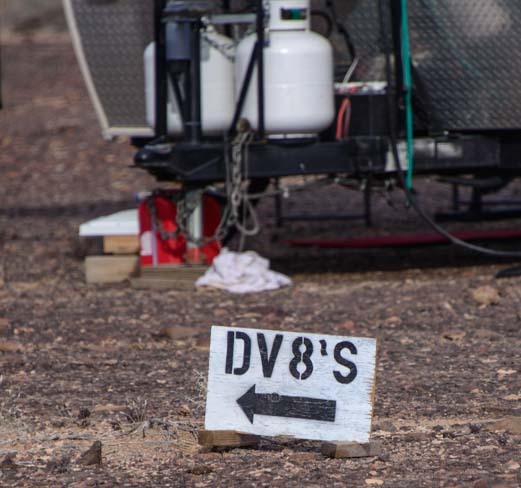 There are RV parks with full hookups, and there are enclosed camping areas called Long Term Visitors Areas (LTVAs) on BLM land near town with toilets and dump stations and water where you can stay for a modest fee. And then there’s the free desert boondocking on BLM land a little further out. The Sonoran Desert in this corner of the state has a hard-packed gravel surface that is easy to drive on, and there is very little vegetation. So, you can drive your rig anywhere, in almost any direction, and park and set up camp. If you’ve got friends that are coming or if you are part of an organized group, all the better. All kinds of groups gather together in Quartzsite each January. There are little signs all over the place pointing to where each social group has convened. The Escapees Boondockers stake out one area, the Off-Road Geezers stake out another, and the Gad Abouts and DV8’s take another. These are just a tiny few of the many dozens of groups we’ve seen. Are you a Gad About? Park here! Some groups don’t have signs but just wave flags instead, and you have to walk over to the group and talk to them to find out what their group is all about. 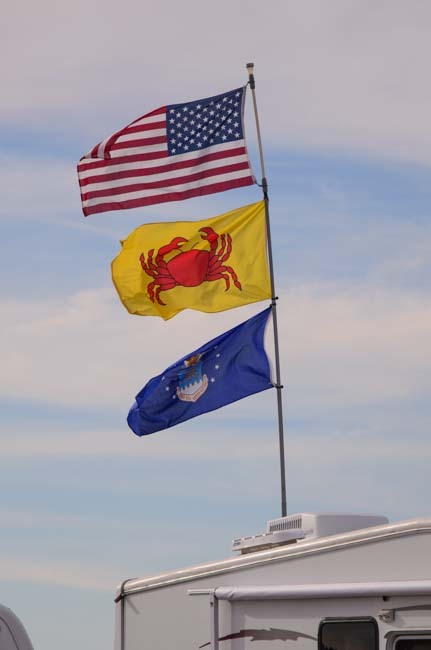 A group of rigs flying a big yellow flag with a red crab on it really got us guessing. 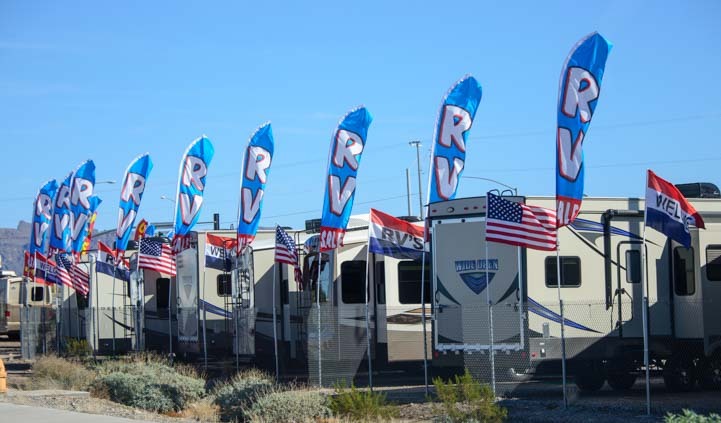 Flags fly high from RVs all over the desert. American flag. Air Force flag. Crab flag?? And here they were in the Arizona desert doing the Quartzsite RV camping thing!! Others just stake out a spot of their own without being part of an organized group. So it has always been for us. We found a quiet corner and got set up. 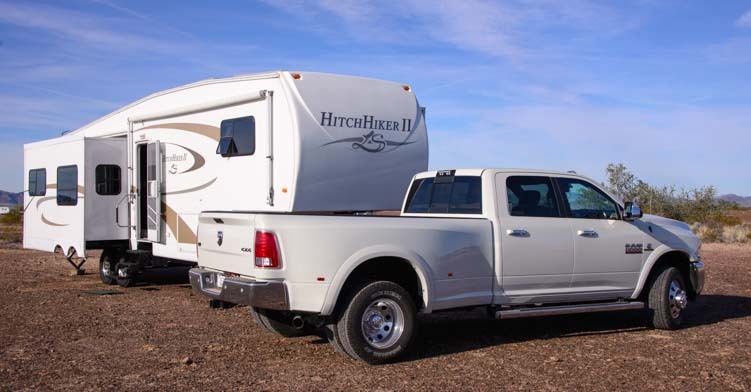 However, this year, right after we unhitched our new truck and started leveling our trailer, a couple walked over and told us we were about 100 yards from the Hitchhiker fifth wheel gathering. They were all just beyond the next wash. Since we own a Hitchhiker fifth wheel trailer, they suggested we come on over for happy hour and meet the gang. The Hitchhiker group was a great bunch to hang out with. And since Hitchhikers are no longer made, there was no problem joining in if you were in some other kind of RV. Two couples were in Mobile Suites! What a fun group! They all knew each other from the very active Hitchhiker Owner’s Forum, a forum I haven’t frequented for many years since I first researched trailers before we went full-time. No matter! When we got over there we were welcomed like family, and immediately handed paper plates and forks, and told to go grab some grub from the large table of sumptuous food. We joined the circle around the campfire and had a blast. Over the next week we spent every afternoon and evening with this really fun crowd. How cool to find that we were a short walk from the Hitchhiker gathering!! Campfire storytelling is always a blast, and Lee and Christine regaled us with hilarious tales from their careers as dog trainers for Hollywood’s A-list stars. Steve, Jean and Pat shared great tips from their RV trip to Alaska last year. Old salts Rick and Virgie told stories of their coastal and offshore sailing adventures between California and Mexico navigating with nothing more than a hand-bearing compass and a sextant back in the 80’s. We were amazed when they described entering the stunningly beautiful but dicey bay of Careyes at night, an anchorage that we loved but that’s so tricky that few sailors trouble with it. There was a campfire and great food every night. Our location was about 12 miles north of town on Route 95 and then east on Plomosa Road about 2.5 miles. There are a dozen turn-offs to both the north and south along a three mile stretch of Plomosa Road where you just drive out into the desert with your rig and find a place to park. There were little groups everywhere we turned. 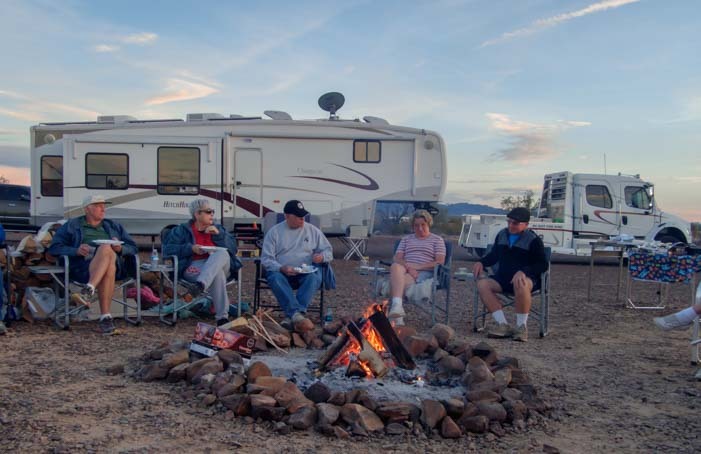 RVers gather all over the place on the BLM land surrounding Quartzsite. What’s fun is that the same groups claim the same trees and washes and fire rings in this part of the desert every year. Little groups in camp chairs can be seen everywhere. Interestingly, this is the corner where a lot of the single RVers hang out. The Solo’s and the Loners On Wheels were not too far from us, and the WINs (Wandering Individuals Network) were a really big group nearby. 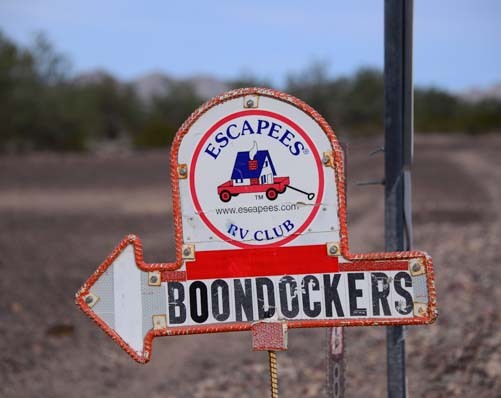 The Wandering Individuals Network are a fun-loving group of single RVers. The funny thing is that with all of these people busy socializing in the desert with their RVs, there’s a business opportunity for all kinds of RV service people. 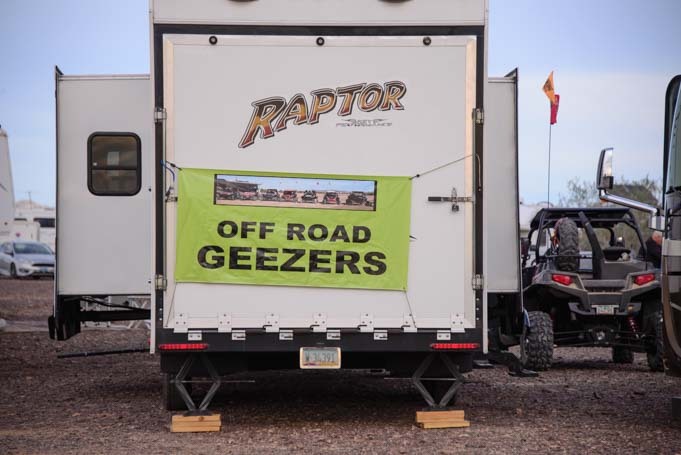 A really funky undercurrent of the Quartzsite experience is all the vendors who capitalize on repairing and upgrading the RVs that show up in the desert. They take full advantage of serving this captive audience for a few weeks. We saw mobile RV repair service guys everywhere. The RV Mobile Repair folks were out in force! Not only did we see them in town, but they were zipping across the desert too, fixing everything from windows to awnings to electrical systems. No customer is too far out! Getting it done… in the desert! Some guys are general practitioners, while others are specialists in one area of RV repair or another. Nothing like getting the RV awning repaired while having a beer in the desert. This desert camping is all dry camping, of course, and you can see just about every imaginable kind of boondocking setup out in the desert. Some folks have big, elaborate solar power systems on their roofs, and others have just a solar panel or two propped up on the ground, while many many others simply run a generator for a few hours a day. 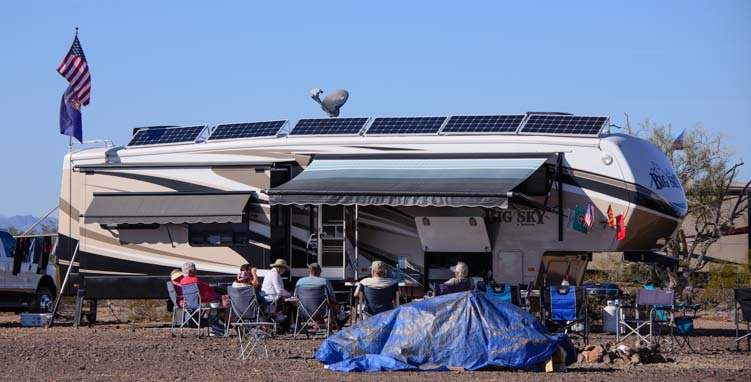 Many RV rooftops sport solar panels, and there are all different configurations. Naturally, cocktail conversation frequently turns to electrical systems, solar power and batteries, and how to keep them charged. 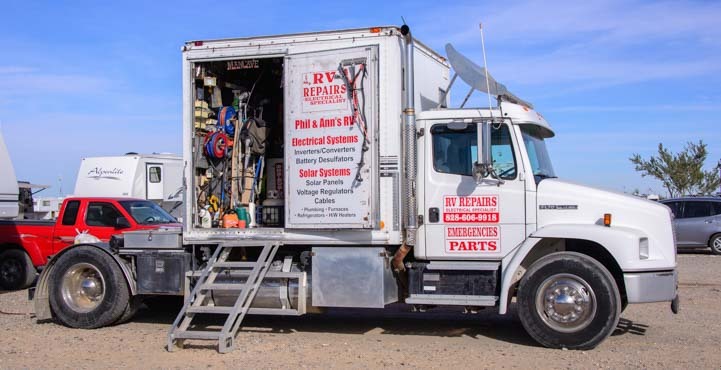 Mobile RV service guys that specialize in electrical systems are lept busy all day long. A few solar installers in town have lines out the door as well. 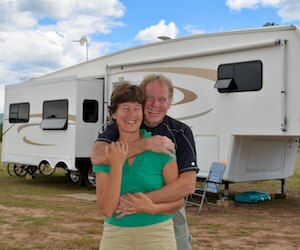 Some mobile RV techs (like Phil & Ann’s RV) specialize in electrical work. What a workshop! 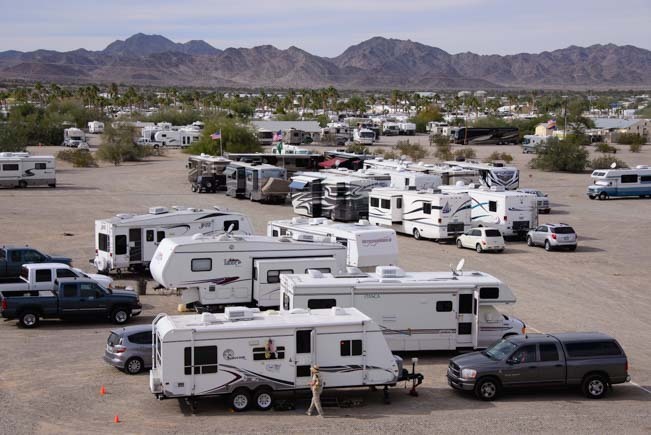 Lots of folks come to Quartzsite looking to upgrade their rig too, and RV retailers set up shop for a few weeks in town with temporary lots full of new and used rigs. There are RVs for sale on every corner. Lots of folks come to Quartzsite with dreams of finding a new rolling home. For us, this was a really special Quartzsite year. Not only did we meet up with a great group of people, but the weather was pretty near perfect the whole time, with warm days and almost no wind (it can be very windy and dusty there!). Best of all, the sunsets were divine!! We visited Quartzsite for the first time this year as we anticipate buying our new RV and going fulltime later this year. We stayed north of Phoenix and drove over to the Q on Tuesday via Hwy 60. I remember cresting the slight hill and seeing RVs spread out as far as the eye could see all around the Q. Afterward, we retreated to the luxury of our resort in Cave Creek (and dreamed of being in the desert with stars overhead)! It’s quite a scene. Not nearly as plush as a resort in Cave Creek, but well worth experiencing! How do you make reservations for Quartzite? Is there electric? septic hook ups? Somewhat confused..
Quartzsite is a town in Arizona that is home to many RV parks where you can make reservations for sites that offer full hookups. The BLM (Bureau of Land Management) also manages Long Term Visitor Areas where you can boondock but still have access to basic amenities like toilets for several months for a very low fee. The BLM also manages land surrounding the town of Quartzsite where you can boondock for up to 16 days for free but with no amenities at all. You can read reviews of some of these places at this link.